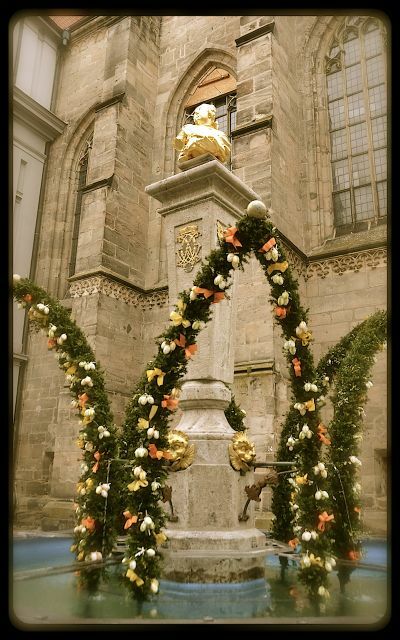 Osterbrunnen, or Easter fountains, herald spring’s return to chilly Germany’s Franconia or Franken region. 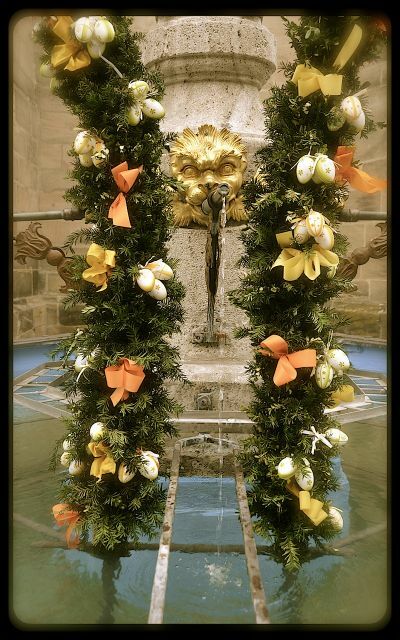 Each year, wells and fountains in town centers are dressed with boxwood cuttings, ribbons and delicately-painted pastel eggs. The custom celebrates water’s life-giving properties. 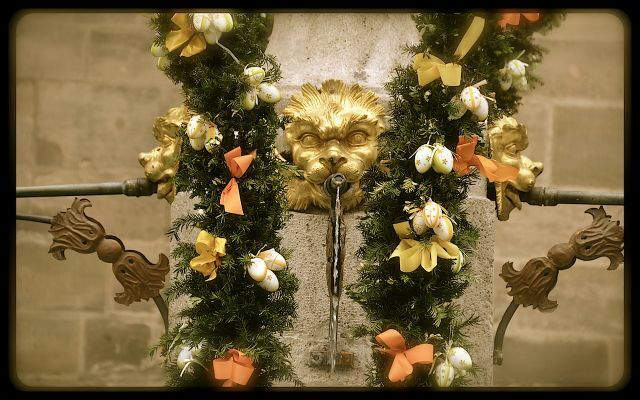 The decorations typically spring up one week before Easter Sunday and they grace the fountains for a week thereafter, lending colorful accents to cobbled lanes and village centers that have been slumbering during the grey and frigid winter season. 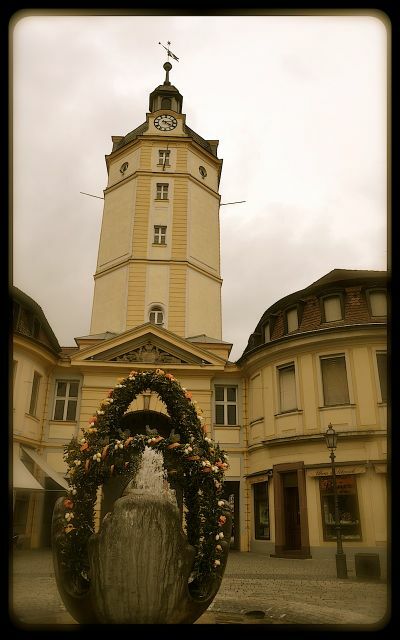 In preparation for this long Easter weekend, my mother and I swung by her favorite Ansbach bakery last week, tucked away in the small city’s Altstadt, or old town. 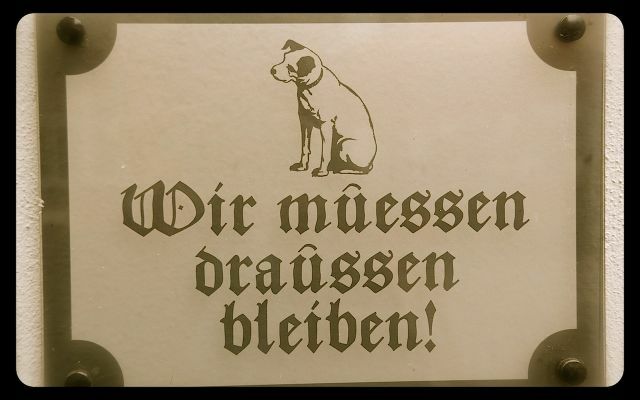 Though dogs are beloved in Germany and often seen accompanying their masters into department stores, cafés and restaurants, a sign outside the bakery indicated that Maltese, pup, Gigi had to remain outside while we loaded up the wicker basket with baked German goodies. 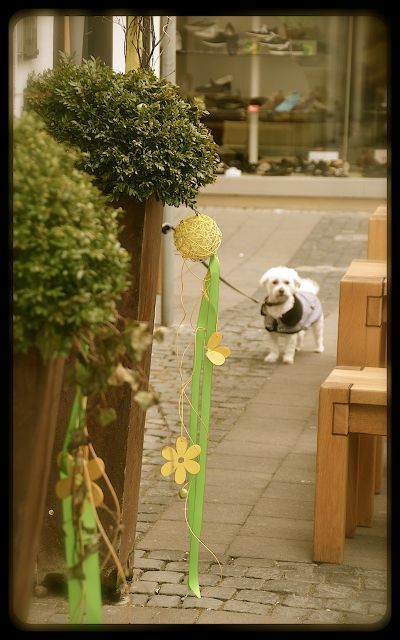 In such establishments where dogs are verboten, there are hooks outside on which furry friends can be tethered while the Hund’s owner is inside shopping. I have been picturing you in the Far East. Quite a jump to Germany. 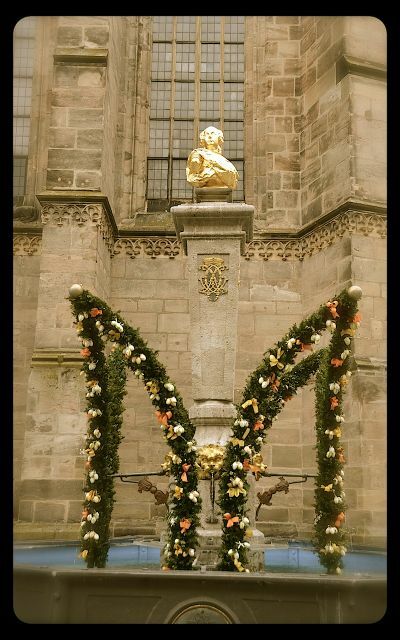 Good to see you have met up with Mom for Easter. I bet she missed you. Was it ever a big jump to the land of order! :) Though we’re missing dodging cows and auto rickshaws now, it’s delightful to be back with my parents and friends – until we embark on leg two of our sabbatical. Here’s hoping you had a lovely spring weekend. Those blossoms on your most recent post are lovely! Tricia! Did I miss something? When did you make it back to Europe? 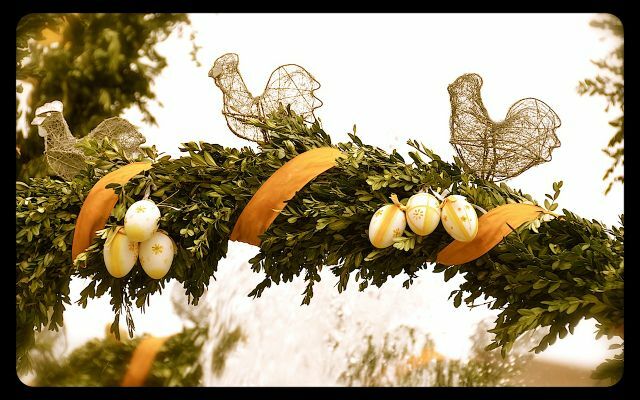 Happy Easter and lovely post! Welcome back to your home! 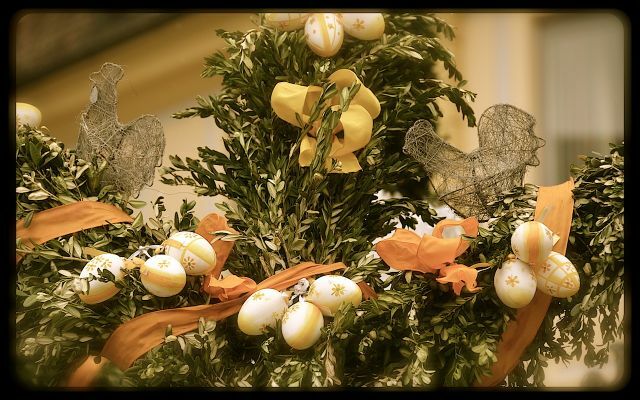 Russian Orthodox Easter is this weekend so I will try and document it. I hope you like my California posts! Will you be dyeing eggs this weekend? My great-grandmother (who was of Eastern European ancestry) used to color eggs using natural ingredients (purple onion peel, etc.) I think this might have been common in Russia too? We’re back ‘home’ for a few weeks but then flitting on to the next flower, so to speak. Not sure where we’re off to next, but it’s exciting! Tricia – take a look at the post. It sparked some interest in decorating eggs: http://arhitekturaplus.wordpress.com/2012/04/13/serbian-easter-easter-eggs/ I am glad you lkiked the Cali shots! It really was fun to photograph there – great light. Overuse fatigue – perhaps!! I am giving the camera a little rest…. for now. Keep me posted of your plans! They’re lovely – it’s exactly what my Lithuanian-American great grandmother used to do… So happy you shared the project so that I can also give it a whirl and remember my Oma! Don’t let you camera nap too long. 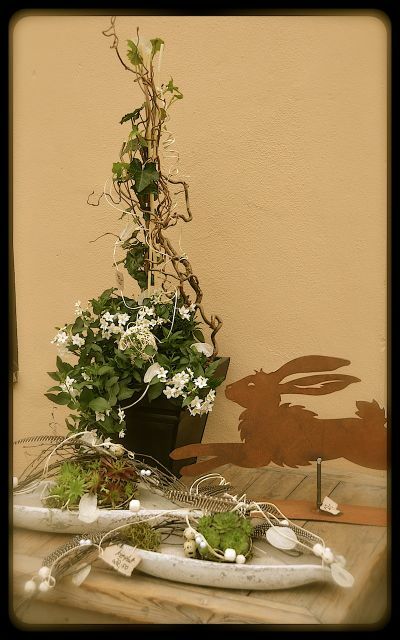 :) Happy Easter celebrations this weekend! I would love to see your decorated Eater eggs! Please take some pics!